The guitars I build are responsive and allow the player to express their own musicality. I always aim to make guitars that I would be happy to own and play myself. 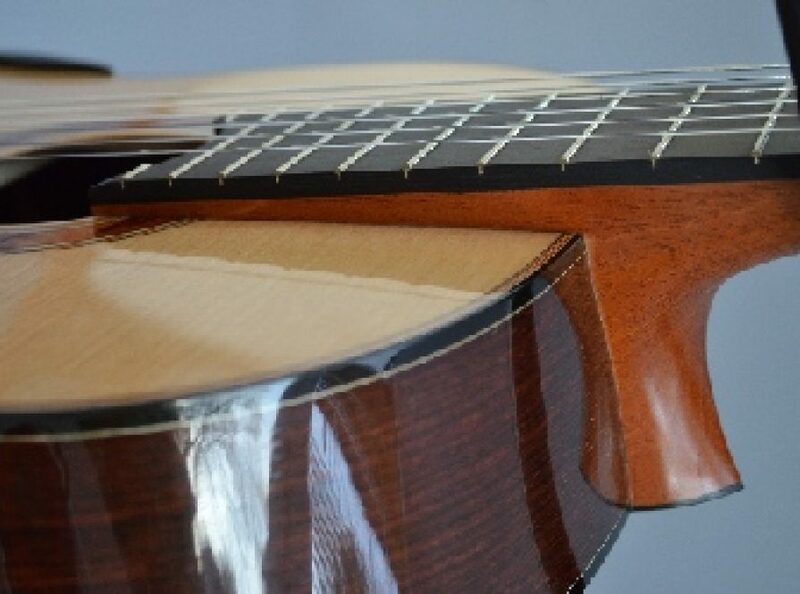 Built mainly in the Spanish tradition, my guitars are sensitive to the player’s touch, with good clarity and separation. They have deep, warm basses and sweet trebles, with good balance. 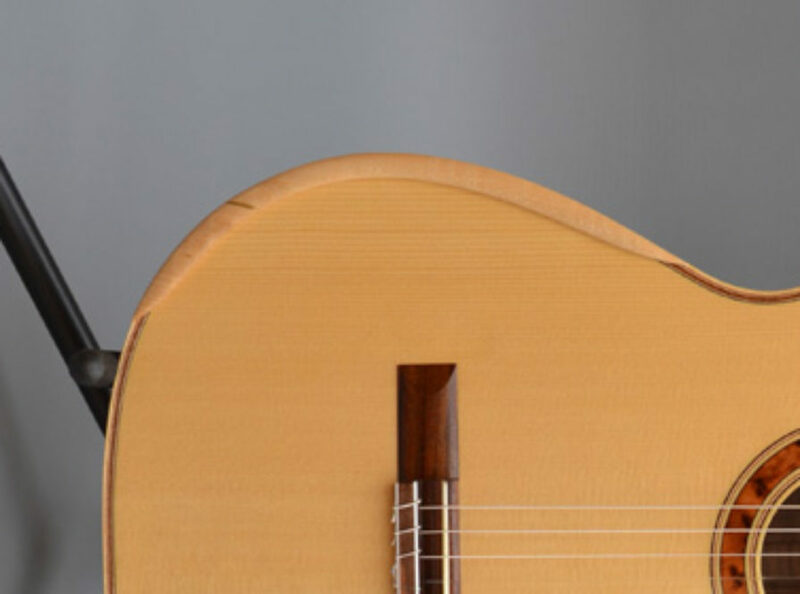 Ease of playing is an important consideration, and is achieved by attention to detail in shaping the neck, finishing the fingerboard and frets, and accurate setting of the action, which can be specified to meet the needs of the individual player. Standard scale length is 650mm, but shorter (and longer) scale lengths can be specified. The visual aspect of my guitars is relatively simple, allowing the grain and colour of the particular woods used to determine the visual impact of the guitar. Traditional finishes are used, either French polish or Danish oil, which enhance the natural beauty of the wood, without compromising the tone. Top quality European spruce is normally used for the soundboard, although western red cedar is an option. A wide variety of tonewoods are available for the back and sides. I now also offer guitars made without using any tropical hardwoods (see images of my 100th guitar here). 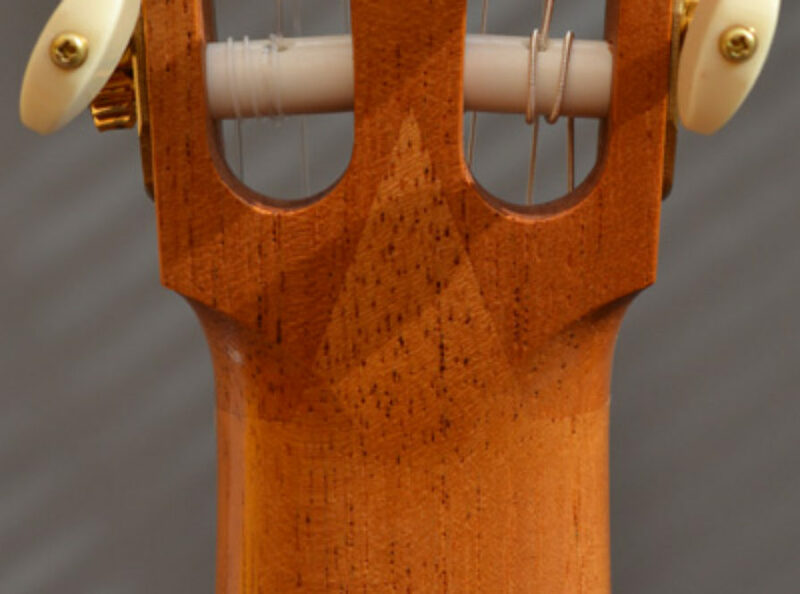 Elevated fingerboards can help improve access to the upper frets. 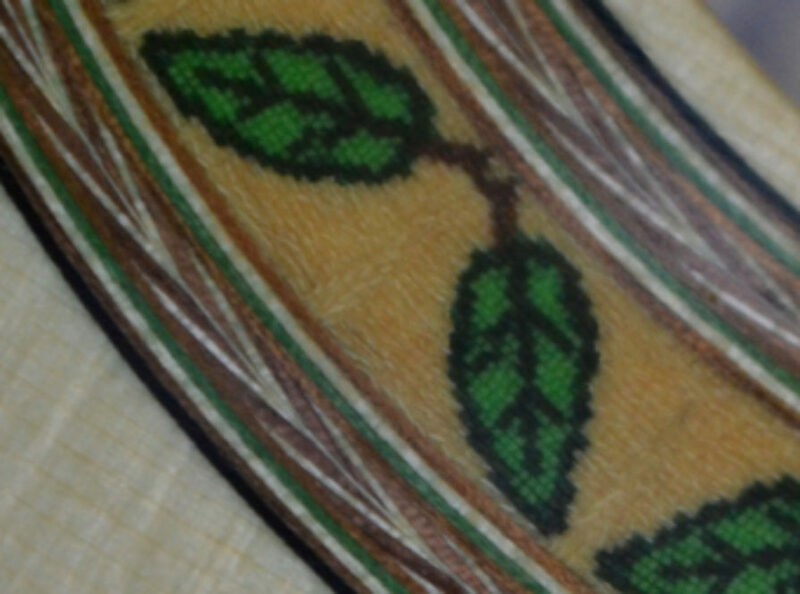 My leaf motif rosette is used only on guitars made entirely from non-tropical woods, FSC certified where available. 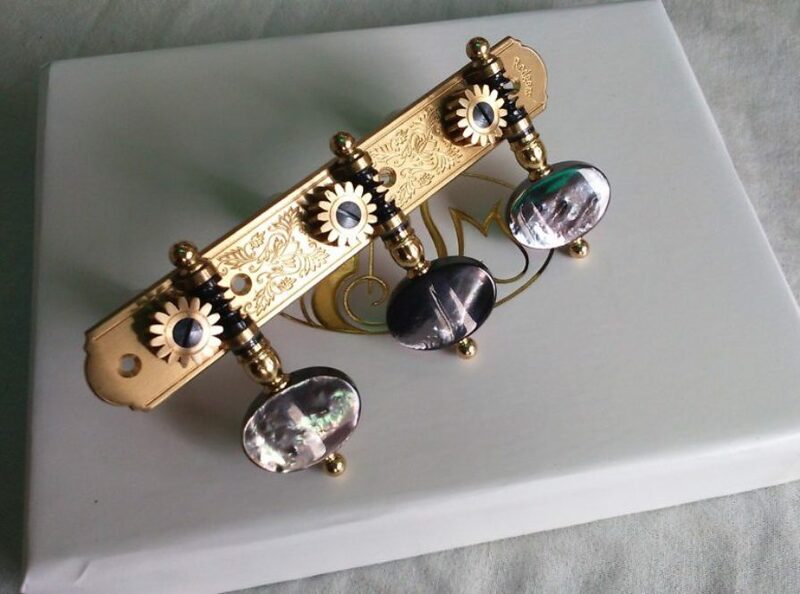 Rodgers handmade tuners are the highest quality available, and have options for backplate style, engraving pattern, button material and shape, and self-aligning bearings. Armrests improve player comfort and can be either permanently glued, or removable. Read more. This traditional rosette has a diamond-patterned central band made of 0.5mm walnut and maple squares, and fine herringbone outer rings. The V-joint is a traditional method of attaching the head to the neck of the guitar. It was used by Hermann Hauser on his guitars, and although it does not add anything structurally, it looks very elegant. Good looking and beautiful sounding guitars. I have the pleasure to play James Lister’s non-tropical wood guitar during this year. The use of unusual materials, knowledge and high quality workmanship create a guitar with a rich and beautifully sweet sound. It is rare to read a description of a guitar that lives up to the expectation it creates. 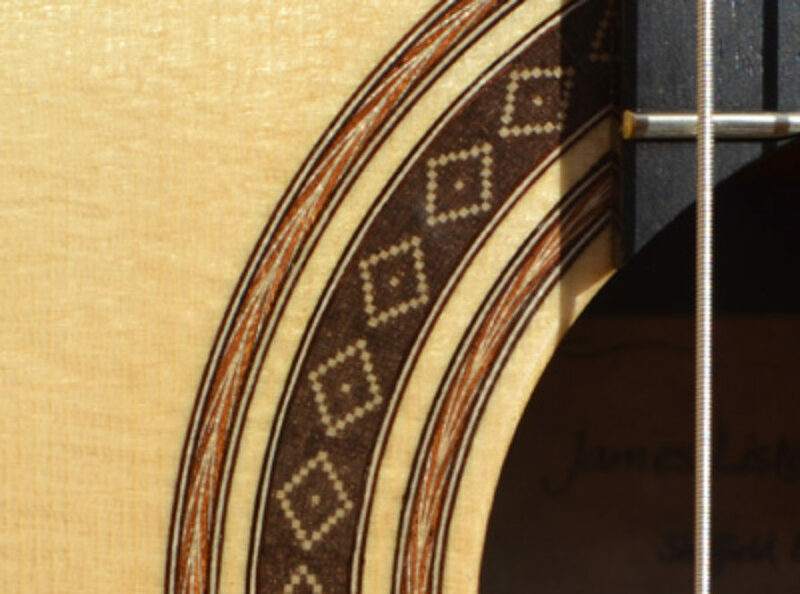 James’ guitars are not just beautifully crafted instruments, they sound and play better than just about any other hand-made guitar I have played. Since the arrival of my Lister the other guitars I own have been hardly used (I now plan to sell the Ramirez 1a I thought I would never part with). The versatility, depth of sound and quality of the instrument are all hard to fault – close to perfection in almost every department, and I am an enormously fussy player! It was a pleasure to play James’ guitar, it really was very impressive. I’ve heard a lot of guitars by relatively young or unknown builders, and this one far exceeds the typical level I hear. Very nice instrument! Left a career in physics and engineering to pursue a new vocation. Completed a further 2 years of study at Newark College, specialising in Classical Guitars. First International Exhibition at the GFA in Los Angeles, California. Continuing to develop my own guitar design, and promoting use of non-tropical hardwoods.